The next day I went to Skutari where I had booked a hostel which had fast internet so I could download all my work data again from my work server in Germany. All the other data was on the harddisk that has been stolen in Bulgaria. Having a place for laundry wasn’t the worst idea as well. I was already so used to sleeping in the van that I decided to stay there as well for the night and don’t use the room in the hostel. During the day the owner took the few people from the hostel on a ride to a close by river, it was a really beautiful place, where we jumped of the cliffs, swam in the clean water and had an amazing time that was perfected with some ice cream on the way back to the hostel. That same evening I got a text from Ekatherina that she just made it across the border from Montenegro and if I could come to pick them up. So the rest of the evening was spent with story exchanging, cooking and early exhausted going to bed. After paying the bill at the hostel (which was again higher than agreed) I took the girls to visit the same small river like the day before. During that time there was a big heatwave smothering all Europe and after coming back from the river we were already sweating like crazy again. 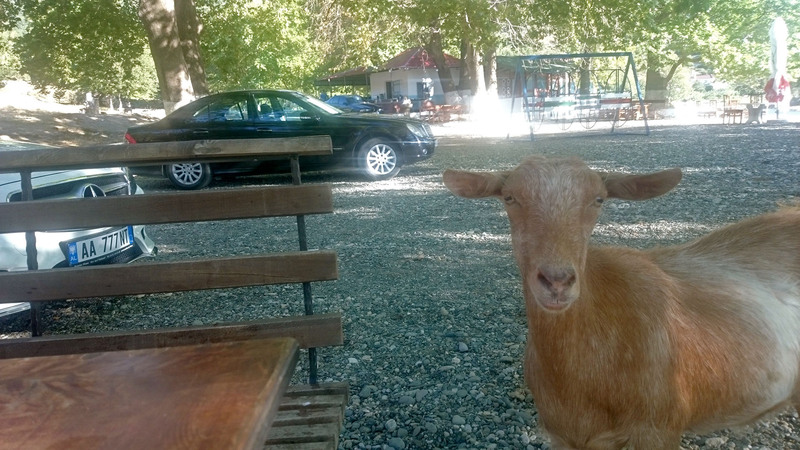 We decided then to drive up into the Thethi National park that was up into the mountains of north western Albania. It was the right decision as the temperatures dropped with every meter we climbed. After reaching the peak of the mountain range we had to descend down the other side on a gravel dirt road that didn’t fancy any fence or anything to keep you from falling off the cliff. The road was about 1,5 cars wide, so if you happen to meet another car, there was always the don’t-fall-off-the-cliff car mambo. We made it down into the valley without incident and the temperatures and sight was exceptional. We had enough food and alcohol for two nights there was even some internet connection so we stayed there and hoped for the heat to die away in the valley. In the night we even got a little thunderstorm, but nothing too bad. Ela was always sleeping in a tent so Kate and me had the car for ourselves. With the heat of the days before that was the only way it worked. Even with open roof window, open sliding windows and cracked trunk it was just bearable heat wise. After the two nights in the mountains and news that the heat in the lower altitudes is better as well we went down to the ocean. The roads in western Albania are better so it wasn’t too bad. We found a cool place about 100m from the ocean to spend the night. In the evening we prepared some food and had a little bit of good Albanian wine together. It was full moon, so we decided to go and swim in the ocean and enjoy some music on the beach. It’s better at night, because then you can’t see the muddy brown color of the sea and the beach is not crowded with people. After about one hour we took a shower and went back to the car. Even though we were only 100m away from the car somebody took the chance and tried to steal my bike that is attached to the back. It is locked securely with a U-Lock. That didn’t keep the thief from trying to steal my wheels. But because the U-Lock is not flexible he couldn’t lift the bike to slide the wheels out. Apparently that made him so angry, that he ripped of the frame bag and my bike computer. I mean literally rip off!!! The bike computer was torn of the cable being utterly useless to the thief and the velcro-strips that are attaching the frame bag, where ripped off at the seams. I think for most people it shouldn’t be too hard to figure out how velcro works?! They were successful though in stealing my saddle bag that had my tire repair kit and bike multitool in it. Left my Brooks saddle behind though… Now with everything strewn around the car (we had the dirty pots and pans for cooking hidden under the car) I went to attach everything back to the car, used the cable lock for the wheels in addition to the U-lock and went to sleep with a bad feeling in my stomach. 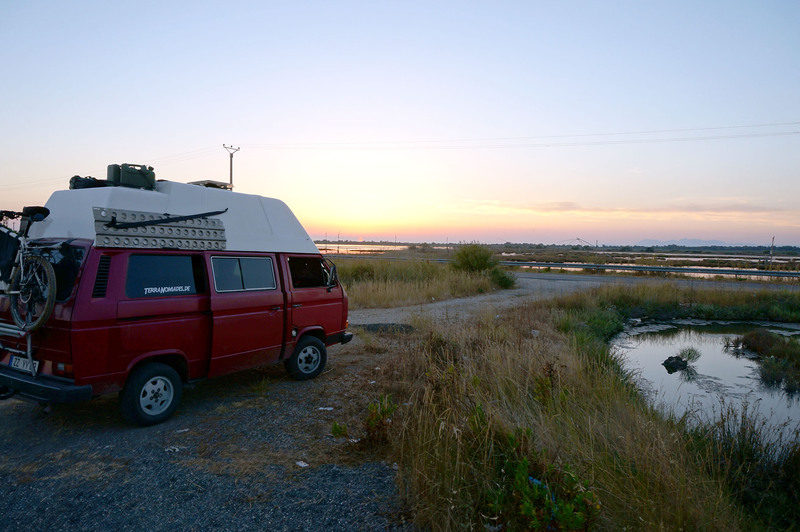 Next morning we left the place and headed Elbasan, where Ela has been able to find a warm showers host who was willing to take the three of us into his home. That evening we did some talking and he showed us some nice place for good food, but nothing spectacular. During our talk we found out that he wanted to go to lake Ohrid (in the east between Albania & Macedonia) as well. So we all got into the car the next day and drove to the lake together. Upon arrival we said our goodbyes and found a place by the lake. The gate to the place was open, so we asked some people working there, if it was ok if we camped there – No Problemo! While I had to do some work, the girls went to explore the city. I found the lake quite disappointing. Everyone told me how awesome and beautiful lake Ohrid is, sorry not me! In the evening we went to stroll along the lakeside which was full of people having a good time. We tried to find a place to eat, unfortunately most places didn’t have a menu and took quite some time to think about their prices before they told us. In the end we had a good time and spend our last money for a good meal. This time we spent less for 3 people including beer than I had spend at the first place I went too!! We had agreed to visit the Macedonian side of lake Ohrid the next day (Ana highly recommended it to me) In the morning we where woken by some guy knocking at Ela’s tent and talking to her. After a while we figured out that it was apparently the owner of the place and he wanted us to pay him 10€ for sleeping on his lawn. Since we spent all our money the night before I told him that this was not gonna happen and we asked around and everyone told us we could sleep there. I ended up giving him my last few coins (~3€) and we left the place. 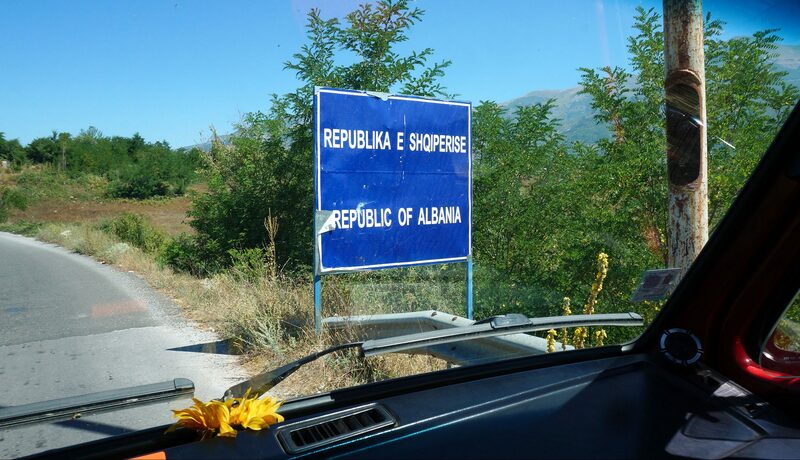 This somehow added to my unfortunately not so good overall picture of Albania. All everyone seemed to want from you is money, this makes for an uncomfortable feeling. You tend to not trust anybody, because you expect them to ask you for money they really next moment. Same goes for overpaying since there are no prices posted in most places. So I’m sorry to say it, but Albania will be the first country on my list I would rather not visit again in the future, it was not all negative as you have read in the text, but still. I’m sure a lot of people had good experiences as well, but as this is my personal experience, it is what it is – personal.